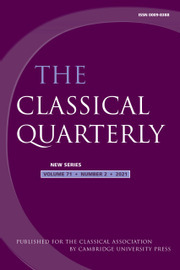 The Classical Quarterly has a reputation for publishing the highest quality classical scholarship for nearly 100 years. It publishes research papers and short notes in the fields of language, literature, history and philosophy. Two substantial issues (around 300 pages each) of The Classical Quarterly appear each year, in May and December. Given the quality and depth of the articles published in The Classical Quarterly, any serious classical library needs to have a copy on its shelves.